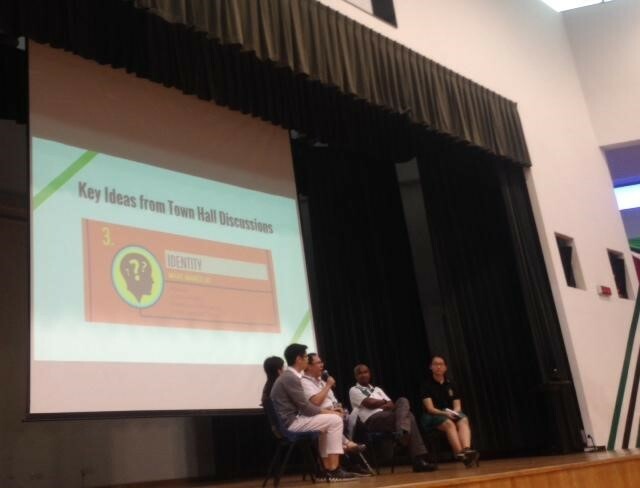 Year 6 Assembly on the 29th of April saw Mr Chan (Principal, Raffles Institution), Mr Magendiran (Senior Deputy Principal, Student Development) and Mrs Reavley (Deputy Principal, Curriculum Y5–6) engaging in a dialogue with the school on issues of concern to the batch. What differentiated this talk from others was the direct line of communication between student body and management: questions addressed during the talk had been formulated and voted in by students for the Principals to answer. This process of gathering questions and feedback did not start with the Year 6 Assembly. It had in fact gone back to 2 weeks prior – when Council first held its Town Hall session with students to get feedback. Three of our writers who attended this session give you a behind-the-scenes look. We weren’t messing with you. When we first walked into the unusually high-ceilinged Stamford Training Room, our minds were already churning out scathingly critical article titles and witty one-liners to put down the event. Having long been sceptics of Student Council and their place in the school, covering their town hall session seemed like an excellent excuse to air our grievances to the population at large. Lasting an hour and a half, the Town Hall session conducted by the 35th Communications Department of the Students’ Council aimed to create a judgement-free, filter-free environment for students to bring up their concerns and queries to the school – exactly the kind of thing your friends would scoff at you for if you attended. 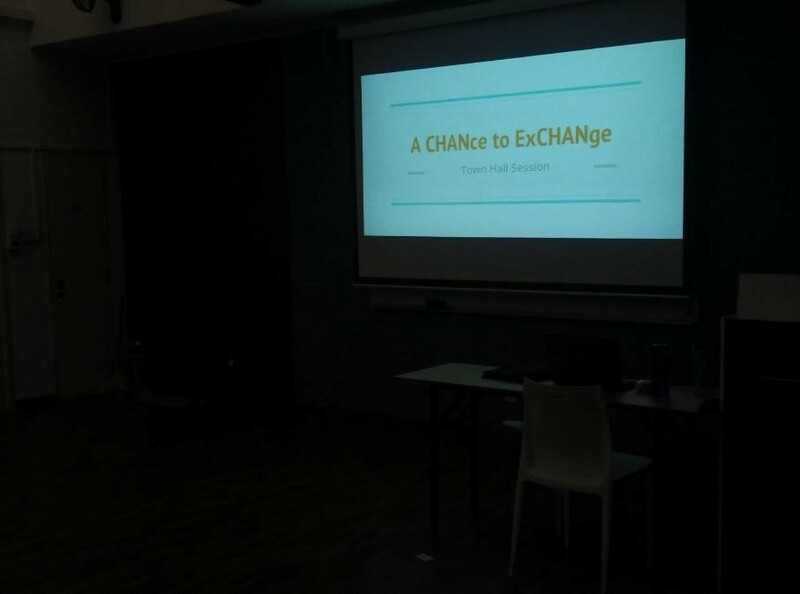 While a similar discussion was conducted sometime last year, what differentiates this one from last year was the direct impact it was to have on school discourse: the discussion held would indeed shape the discussion Principal Mr Chan Poh Meng would have with the Year 6s centring around school-related changes. At first blush we’d admit that what enticed us the most about the session was the abundance of muffins. While the minimal publicity for the event had led to a only a modest showing of students, the Councillors maintained an air of infectious enthusiasm, giving a short briefing on the agenda for discussion before breaking up participants into small groups for discussion, where participants could raise issues and share opinions on various changes and happenings in the school, ranging from the cancellation of DramaFest/DanceFest to the abolishment of handshaking in morning assembly. After a short break, the councillors consolidated the three main points of interest which emerged from the session, specifically Communication, Empowerment, and School Identity (Editor’s Note: Familiar words for Friday’s assembly). Firstly, students expressed a desire to have clearer communication with the school, so as to gain insight to the rationale behind certain decisions made by school management. Secondly, the idea of empowerment – the relationship between teachers and students affect both the responsibilities and autonomy students have in areas like CCAs, leadership and even discipline. Finally, a number of questions were raised about school identity in the sessions, such as “What does the public think of us?” and “Who do we think we are?”. Councillors assured members of the audience that these particular ideas would be brought up to Mr. Chan so that they can be further discussed during the dialogue on 29th April. A preliminary concern that we had was the potential for this to be nothing more than a mere ‘talk shop’ – surely an inherent limitation of anything concerning change in school policy. Councillors themselves, in group discussions, had concerns of their own which they intended to raise to the principal as well. Still, they acknowledged that the complex system of bureaucracy and the numerous checks and balances meant that change would have to be approved, and then implemented by numerous bodies including the Board of Governors and the Ministry of Education. What we could take away however from the Town Hall Session was this: when contentious school policies must remain unchanged, the best response would be to disclose and explain why these happen, and/or precedents and tenets that preserve the status quo. Where these policies can be changed, then we as a student body can be proud to say that we stood up, contributed to and effected change. Indeed, platforms to discuss and improve policy must be ones taken seriously by every stakeholder for change to genuinely reflect the needs of a population. The burden to reflect and renew may seem to be on the school administration and the Students’ Council, we as Rafflesians should take into account too that it is only a clear expression of legitimate grievances that trigger such processes. This Town Hall session, serving as a precursor for meaningful conversation between the principal and the student body, will surely not be a one-off event, and neither too will the Principals’ Dialogue. Half an hour of dialogue after all, as pointed out did not mark the end of a dialogue but rather, the beginning of one. Any further questions for the Principals and Deputy Principals can be submitted here. The Principals and Deputy Principals will be holding a follow-up session with our Press writers next week too to address the remaining questions that were not answered during the dialogue. Look forward to our article.